A capacitor is a device that stores energy in the electric field created between a pair of conductors. Capacitors are sometimes refered to as condensers. A capacitor can store electronic energy when disconnected from its charging circuit, so it can be used like a fast battery. In AC or signal circuits a capacitor induces a phase difference of 90 degrees, current leading voltage. Capacitors are commonly used in power supplies where they smooth the output of a full or half wave rectifier. Because capacitors pass AC but block DC signals, they are often used to separate the AC and DC components of a signal. This method is known as AC coupling. Storage capacity, listed in Farads. Since the farad is a very large unit, values of capacitors are usually expressed in microfarads (µF), nanofarads (nF) or picofarads (pF). Working voltage, the allowable voltage that can be applied across the terminals of the capacitor. Polarization specifies if the device is sensitive to the polarity of the applied voltage. Dielectric or insulation material used between the plates. Typical designs consist of two electrodes or plates separated by an insulator or dielectric. Because the conductors are separated by an insulator, electrons cannot directly pass across the dielectric from one plate of the capacitor to the other. When a voltage is applied to a capacitor through an external circuit, current flows to one plate, charging it. Consequently, current flows away from the other plate, producing an opposite charge. In other words, as the voltage across a capacitor changes, the capacitor will be charged or discharged. A polarized ("polar") capacitor is a type of capacitor that have implicit polarity -- it can only be connected one way in a circuit. The positive lead is shown on the schematic (and often on the capacitor) with a little "+" symbol. The negative lead is generally not shown on the schematic, but may be marked on the capacitor with a bar or "-" symbol. Polarized capacitors are generally electrolytics. Note that you really need to pay attention to correctly hooking a polarized capacitor up (both with respect to polarity, as well as not pushing a capacitor past its rated voltage). If you "push" a polarized capacitor hard enough, it is possible to begin "electrolyzing" the moist electrolyte. Modern electrolytic capacitors usually have a pressure relief vent to prevent catastrophic failure of the aluminum can (but don't bet your eyesight on this). A non-polarized ("non polar") capacitor is a type of capacitor that has no implicit polarity -- it can be connected either way in a circuit. Ceramic, mica and some electrolytic capacitors are non-polarized. You'll also sometimes hear people call them "bipolar" capacitors. Ceramic chip: 1% accurate, values up to about 1 µF, typically made from Lead zirconate titanate (PZT) ferroelectric ceramic. Ceramic capacitors tend to have low inductance because of their small size. C0G or NP0 - Typically 4.7 pF to 0.047 µF, 5%. High tolerance and temperature performance. Larger and more expensive. COG and NPO dielectrics have the lowest losses, and are used in filters, as timing elements, and for balancing crystal oscillators. X7R - Typical 3300 pF to 0.33 µF, 10%. Good for non-critical coupling, timing applications. Z5U - Typical 0.01 µF to 2.2 µF, 20%. Good for bypass, coupling applications. Low price and small size. Polystyrene: (usually in the picofarad range) stable signal capacitors. Polyester, Mylar®: (from about 1 nF to 1 µF) signal capacitors. Polypropylene low-loss, high voltage, resistant to breakdown, signal capacitors. PTFE or Teflon ™: higher performing and more expensive than other plastic dielectrics. Paper: common in antique radio equipment, paper dielectric and aluminum foil layers rolled into a cylinder and sealed with wax. 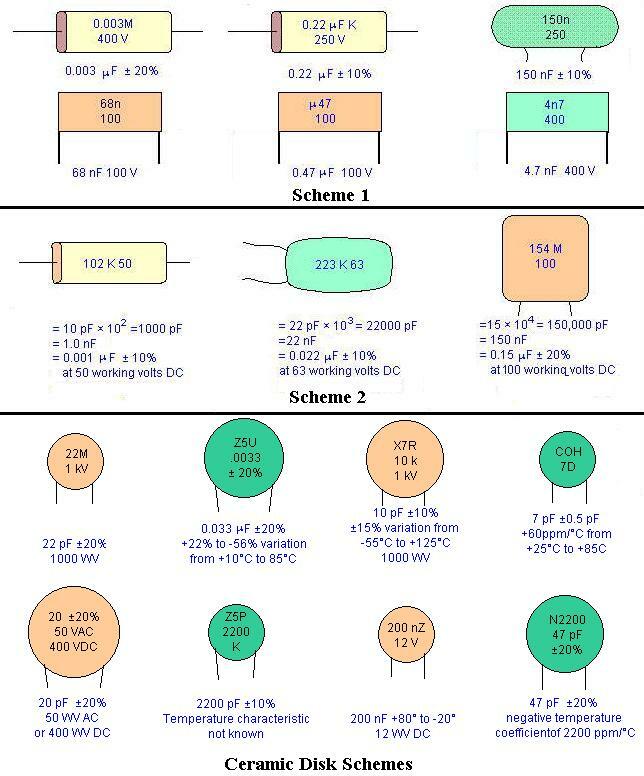 Low values up to a few µF, working voltage up to several hundred volts, oil-impregnated bathtub types to 5,000 V.
Tantalum: compact, low-voltage devices up to about 100 µF, lower energy density and more accurate than aluminum electrolytics, but less accurate and higher energy density than signal capacitors. Since these capacitors rely on an electrolyte, they are polarized, meaning that they can only support a potential in one direction and are suitable only for DC applications. Aluminum Electrolytic: compact but lossy, in the 1 µF to 1,000,000 µF range, up to several hundred volts. The dielectric is a thin oxide layer. Like tantalum capacitors, these are polarized. They contain corrosive liquid and can burst if the device is connected backwards. Over a long time the liquid can dry out, causing the capacitor to fail. Bipolar electrolytics contain two capacitors connected in series opposition and are used for coupling AC signals. 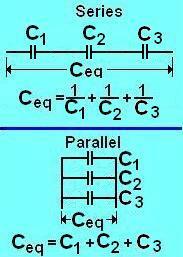 In a series configuration, the current through each capacitor is the same. The voltage across each capacitor, however, can be different. To control the voltage across each capacitor, a very large resistor might be connected across each capacitor. If this is not done, the voltage across an indiviual capacitor might exceed its working voltage rating. Multiple capacitors can be connected across each other (parallel) to obtain a new capacitance value. When capacitors are connected in a parallel configuration, the value of each capacitor is added together. Unfortunately, there is a large array of markings used to identify capacitors. Large capacitor have the value printed plainly on them, such as 10.uF (Ten Micro Farads). Smaller sizes generally have a combination of letters and numbers. The most common coding scheme uses 2 or three digits. A capacitor marked 104 is 10 with 4 more zeros. The first two digits are "1" and "0", then multiply by 10,000 to obtain 100,000pF. This size is otherwise referred to as a .1 uF capacitor. 47 printed on a small disk can be assumed to be 47 Pico-Farads (or 47 puff as some like to say). The marking is 103J indicates a 10,000 pF with +/-5% tolerance. The figures below present an miscellaneous marking systems that might be seen.